It seems like over the last year the amount of literature published regarding QGIS has really exploded. In the past few months alone there’s been at least three titles I can think of (Building Mapping Applications with QGIS, Mastering QGIS, and the QGIS Python Programming Cookbook). I think this is a great sign of a healthy project. Judging by this there’s certainly a lot of demand for quality guides and documentation for QGIS. I recently finished reading one of these titles – Building Mapping Applications with QGIS. (Erik Westra, Packt Publishing 2015) In short, I’m a huge fan of this work and think it may be my favourite QGIS book to date! I’ve read Erik’s previous work, Python Geospatial Development, and thought it was an entertaining and really well written book. He’s clearly got an in-depth knowledge about what he’s writing about and this confidence comes through in his writing. So when I first saw this title announced I knew it would be a must-read for me. In Building Mapping Applications with QGIS, Erik has created a comprehensive guide through all the steps required to create QGIS plugins and standalone Python applications which utilise the QGIS libraries. It’s not a beginner’s guide to Python or to PyQGIS, but that’s what helps it stand out. There’s no introductory chapters on programming with Python or how to use QGIS and instead Erik dives straight into the meat of this topic. I found this approach really refreshing, as I’m often frustrated when the first few chapters of an advanced work just cover the basics. Instead, Building Mapping Applications with QGIS is packed with lessons about, well, actually building mapping applications! So, why do I like this book so much? Personally, I think it fills a a really crucial void in the existing QGIS literature. 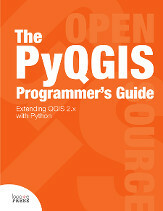 There’s a lot of works covering using QGIS, and a few covering PyQGIS development (eg, the PyQGIS Programmer’s Guide, which I reviewed here). But to date, there hasn’t been any literature that covers developing QGIS based applications in such great depth. It’s just icing on the cake that Erik’s writing is also so interesting and easy to read. Is there any criticisms I have with this book? Well, there’s one small omission which I would have liked to see addressed. While the chapter Learning the QGIS Python API goes into some detail about how QGIS is built using the Qt libraries and a great deal of depth about interpreting the QGIS c++ APIs, I think it could really benefit from some discussion about both the PyQt and Qt APIs themselves. Since a lot of the QGIS classes are either directly derived from Qt classes or heavily utilise them it’s really important that PyQGIS developers are also directed to the PyQt and Qt APIs. For instance, the Qt QColor class is used heavily throughout PyQGIS, but you won’t find any API documentation on QColor in QGIS’ API. Instead, you need to first consult the PyQt API docs and also the detailed Qt c++ docs. It’s often that you may think the PyQGIS API is missing a crucial method, but consulting the Qt docs reveals that the method is instead implemented in the base classes. It’s an important point to note for mastering PyQGIS development. To be fair, I’m yet to read a PyQGIS book which has nailed the interaction between the QGIS, PyQt and Qt APIs. Honestly, that’s a really minor quibble with an otherwise outstanding work. I’m so glad Erik’s written this work and strongly recommend it to anyone wanting to take their PyQGIS development skills to the next level. I’ve been a fan of Stephen Mather’s blog for a while now, and have consistently found it to be a great source of trustworthy information and creative solutions to GIS problems. So when I first saw mention of his work on the PostGIS Cookbook I knew it would be a must-read for me. PostGIS is an essential part of my daily toolkit, and I’ll quickly devour any tutorial or guide which can lead me to better ways to put it to use. And that’s exactly what this book is! It’s full of tips and guides which has inspired me in a lot of techniques I’d never tried or even thought possible in PostGIS. It’s important to point out that this book isn’t a training manual or beginner’s guide to PostGIS. 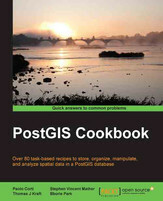 It assumes readers are already familiar with using PostGIS and have a good understanding of GIS software in general. (If you’re looking for a book to start from scratch with PostGIS, PostGIS in Action is a better fit). I think that’s really what makes this book stand out though. There’s currently not a lot of books available covering PostGIS, and as far as I’m aware the PostGIS Cookbook is the only book available which is targeted to experienced PostGIS users. The only criticism I have with this book is that it jumps around a lot between operating systems. While most of the code is provided for both Linux/OSX and Windows, there’s occasional examples which only have code for one specific operating system. It’s a little jarring and assumes the user is well versed in their particular operating system to workaround these omissions. Overall, I strongly recommend the PostGIS Cookbook, and would consider it a must have for anyone serious about expanding their PostGIS abilities. (Also, looks like the publisher, Packt, have a two-for-one sale going at the moment, so it’s a good time to grab this title). The second book I’ve just finished reading is Gary Sherman’s “The PyQGIS Programmer’s Guide“. For those who are unaware, Gary was the original founder of QGIS back in 2002, so you can be confident that he knows exactly what he’s writing about. In The PyQGIS Programmer’s Guide Gary has created an in-depth guide on how to get started with programming for QGIS using python. It takes readers all the way from simple scripts right through to developing QGIS plugins and standalone applications based on the QGIS API. This book fills an important void in the literature available for QGIS. Previously, the PyQGIS Developer Cookbook was the only available guide for QGIS python scripting, and unfortunately it’s a little out-of-date now. PyQGIS scripting can be a steep learning curve and that’s why this book is so appreciated. It would be valuable to have some python knowledge and experience prior to reading this book. While the “Python Basics” chapter quickly runs through an introduction to the language, the book makes no claims to be a comprehensive python tutorial. But if you’ve dabbled in the language before and have familiarity with the python way of doing things you’ll easily be able to follow along. The “Tips and Techniques” chapter, which is a great mini-reference for performing a range of common tasks in PyQGIS (including loading layers, changing symbol styles, editing feature attributes, etc). I’d definitely recommend that anyone who wants to get started with PyQGIS start with Gary’s work – you’ll find it the perfect place to begin.